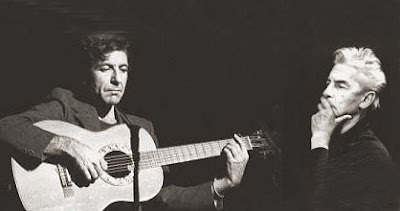 [Leonard Cohen's 1975 European] tour unfolded largely without incident, apart from… the showdown between Marty Machat and Herbert von Karajan in Berlin when the famed conductor, still rehearsing the Berlin Philharmonic, refused to let them in to do their soundcheck. ‘Marty’s ego and von Karajan’s ego – that was quite something,’ Lissauer recalls. That vignette appears in the immensely enjoyable I’m Your Man: the Life of Leonard Cohen by Sylvie Simmons. John Lissauer produced two of the singer/song-writer’s albums, and Marty Machat was a music industry lawyer who managed both Leonard Cohen and Phil Spector. When Cohen had a crisis of confidence prior to appearing at the 1967 Newport Folk Festival and pleaded “I can’t sing”, Machat responded “None of you guys can sing - when I want to hear singers, I go to the Metropolitan Opera”. More on Karajan's ego here. Also on Facebook and Twitter. I’m Your Man was borrowed from Norwich library. Photo montage is my work. Any copyrighted material on these pages is included as "fair use", for the purpose of study, review or critical analysis only, and will be removed at the request of copyright owner(s). My father knew Leonard Cohen as a teenager -- they shared a tent at a summer camp in Quebec, just north of Ottawa, where they were both counsellors. This would have been sometime around 1951 or 1952. Apparently Cohen spent most of the summer in the tent, writing poetry.